There are quite a few works in progress hidden away in various places in my quilting space.. I have gathered some together and am posting them here- these are the ones I would like to work on, and hopefully seeing them up here will encourage me. 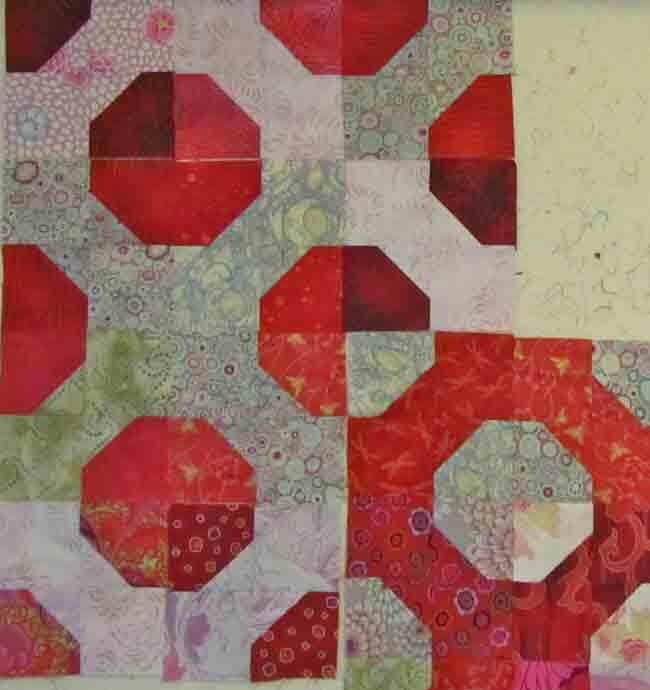 I have started again on the Fassett red bow tie quilt, only have the outer border to do. As I mentioned in my last post, I realize I need 96 blocks for this- almost as many as for the main body of the quilt. Quite discouraging. I’ll try to do a few every day to get that number down. 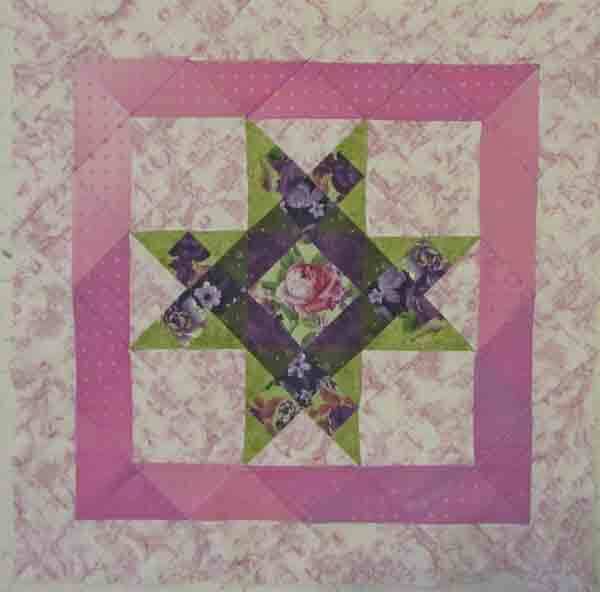 Next up: another quilt that uses a Fassett fabric, this one is just a baby-size quilt. I made the blocks with my favourite tool, Marti Michell templates ( this was the double wedding ring set). 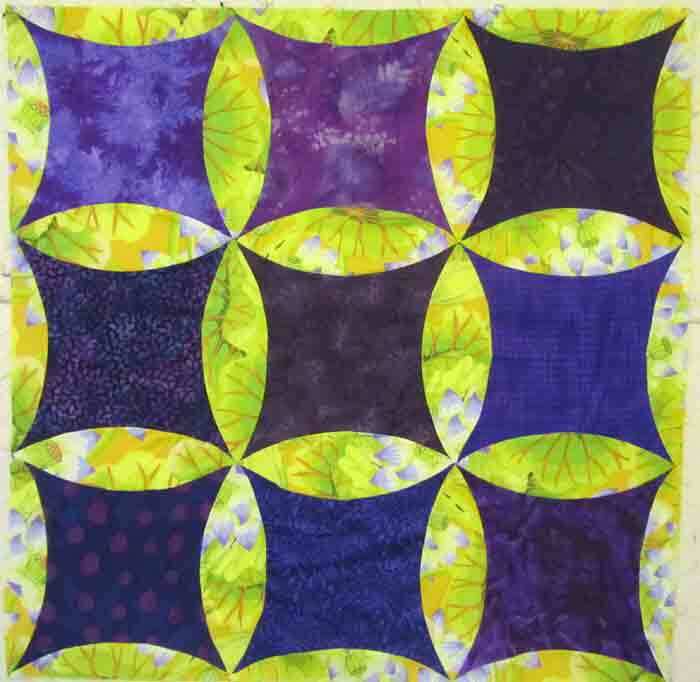 It sat unfinished for quite a while when I realized I had used the same purple batik in two of the blocks- bummer. I finally got the seam ripper out and replaced it. The points on this aren’t perfect, but that is never my most important criteria for a quilt, and I do love these colours together. 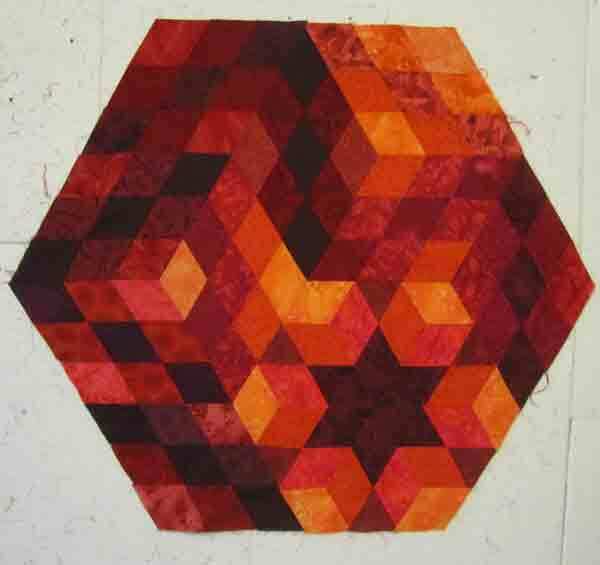 I have made a few of hexagon quilts, and love the look. But because I sew these on the machine, rather than by hand, it can be a bit tedious. 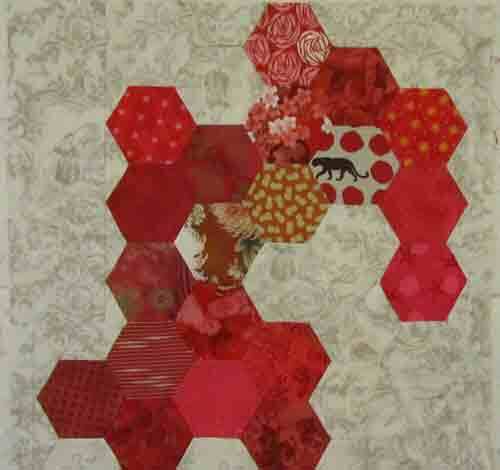 Below are two sets of hexagon “scraps” that I have put together from some asian-inspired fabrics.. the red one will probably become part of a pillow cover one day. The other I envisage as a large panel down the centre of a bed quilt on a ground of a solid or fairly subdued patterned fabric. Now we come to my more “traditional” WIPs. 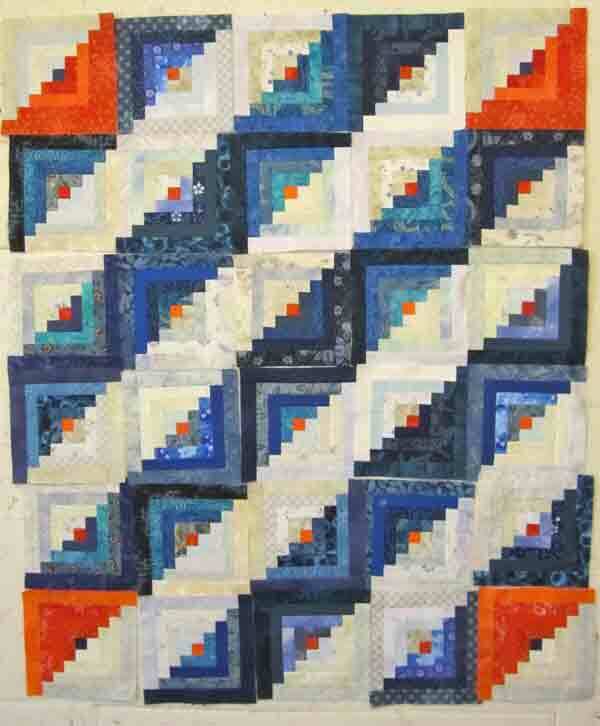 the first is a log cabin quilt. I always wanted to make one, and I found making the blocks pretty straightforward. But I am not loving the orderliness of it. This would make a fine baby quilt as is, but it doesn’t feel like me. So it sits…..
And last but not least, something I started a few years ago. 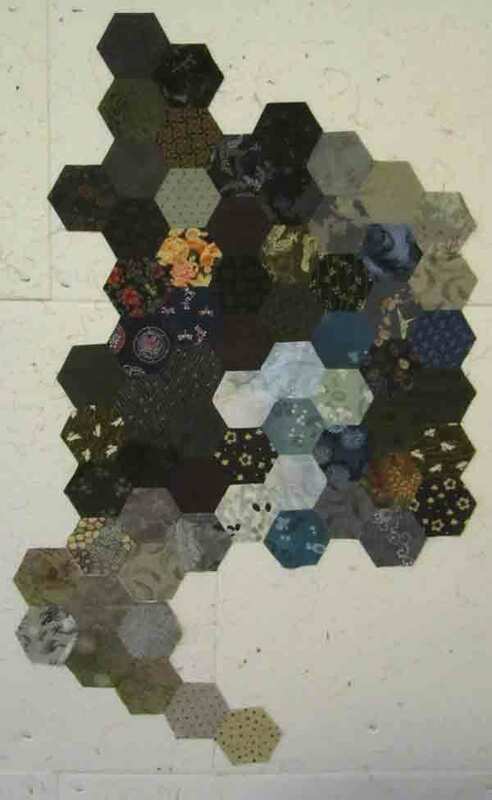 I wanted to make a medallion quilt, and this is the centre block I was made. It doesn’t inspire me right now, so it too sits. Suggestions Welcome! Oops. Almost forgot this one. I was playing with diamonds and loving the way various patterns jump out at you, but what to do with this?